The team of Professor Keon Jae Lee from the Department of Materials Science and Engineering, KAIST has developed a high performance flexible all-solid-state battery, an essential energy source for flexible displays (see paper in Nano Letters: "Bendable Inorganic Thin-Film Battery for Fully Flexible Electronic Systems"). The technological advance of thin and light flexible display has encouraged the development of flexible batteries with a high power density and thermal stability. Although rechargeable lithium-ion batteries (LIB) have been regarded as a strong candidate for a high-performance flexible energy source, compliant electrodes for bendable LIBs are restricted to only a few materials (e.g., organic materials or nano/micro structured inorganic materials mixed with polymer binders). The performance of LIBs has not been sufficient either, thereby difficult to apply to flexible consumer electronics including rollable displays. In addition, lithium transition metal oxides used as a cathode electrode have to be treated in high temperature (e.g., ~ 700 degrees for lithium cobalt oxide). However, it is not possible to anneal the metal oxides, an active material, at this high temperature on flexible polymer substrates. This shows a blue LED emission operated by flexible solid state battery. Recently, Professor Lee's research team has developed a high performance flexible LIB structured with high density inorganic thin films by using a universal transfer approach. The thin film LIB fabricated on a mica substrate with high annealing temperature is transferred onto polymer substrates through a simple physical delamination of sacrificial substrates. 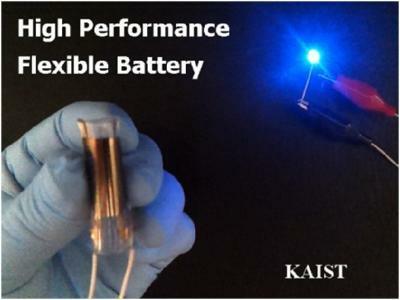 Professor Lee said, "The advent of a high performance flexible thin film battery will accelerate the development of next-generation fully flexible electronic systems in combination with existing flexible components such as display, memory, and LED." The research team is currently investigating a laser lift-off technology to facilitate the mass production of flexible LIBs and 3D stacking structures to enhance charge density of batteries.